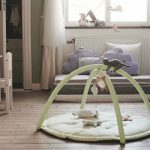 You’ve designed, decorated and furnished baby’s room with the best of baby furniture and accessories, but the most important and often neglected area is safety. Ensuring that the room is safe for the baby is critical and should not be overlooked. Initially the baby will spend most of the time in the baby cot. From a safety perspective it is important that the baby bed does not contain any loose pillows, canopies, teddy bears or bolsters. Soft blankets are avoidable, as are puffy and cushiony mattresses. Also ensure that the mattress fits perfectly inside the crib without any gaps, and that the slats of the baby crib are too narrow for the baby to jam his head between them. Check the room for any damp spots and loose paint or fittings. Cords, ties and ribbons can be a major safety hazard too. Do not tie anything over the baby cot with strings, and avoid curtain and blind ties too. Keep baby monitor cables tied neatly away out of reach. Night lights should be kept away from fire hazardous materials. All clothing, baby toys, baby blankets, sheets and carpets should be washed well before placing them in the baby’s room. This is done to remove the chemicals that are used during manufacturing that can irritate a baby’s sensitive skin and eyes. Install smoke alarms and carbon monoxide detectors in the baby’s room and ensure that these are serviced regularly, and batteries changed as required. A cool mist vaporizer or humidifier can be used to prevent excessive dryness. These also need regular cleaning out to avoid bacterial growth. Sunlight and fresh air are essential for the baby’s good health and growth. Air out the baby room at regular intervals and let the sunlight stream in every day to create a wholesome and pleasant atmosphere in the room. This is especially important if the room is temperature controlled, since constant air conditioning can cause germs to breed. Keep your baby safe with by implementing all these points. But do remember that as the baby starts crawling around, you will need to baby-proof the house too.